Chances are, you’ll hear a lot of people tell you to visit some of the amazing beaches, picturesque landscapes, and top-tier cultural sites. And, yes, you should definitely see those. 1. 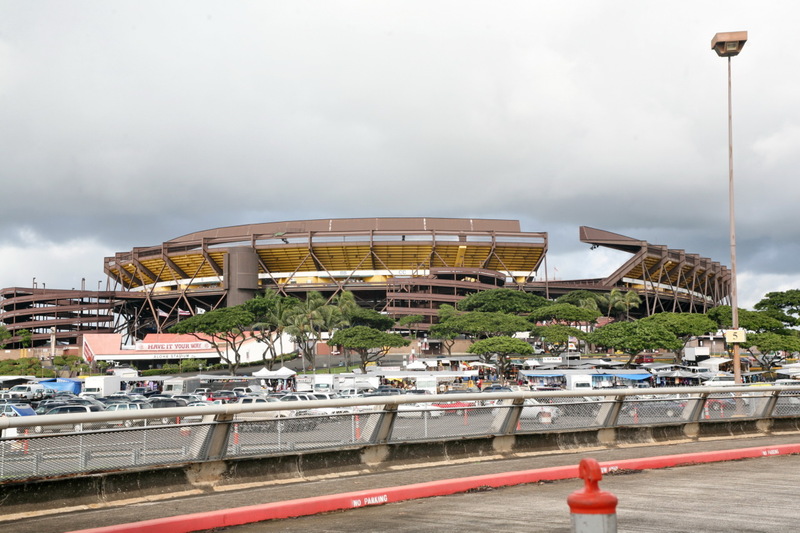 Aloha Stadium Swap Meet: Sadly, Hawaii doesn’t use the Aloha Stadium for much in the way of sports. But, the venue is perfect for one of the quirkiest attractions on Oahu, the Aloha Stadium Swap Meet. Just 20 minutes away from Waikiki, you’ll find Hawaii’s largest open air flea market where the locals shop for the best deals in town. Open three days a week, we offer endless rows of more than 400 local merchants offering the best value on imported merchandise, hand made items, eclectic art pieces, popular local snacks, and other made in Hawaii products. This is sure to be your one stop destination to find that special gift or souvenir for everyone on your list. Open Wed. and Sat. 8-3, Sun. 6:30-3. The Aloha Stadium swap meet features more than 400 vendors. It's a great place to find souvenirs! 2. Honolulu Fish Auction: Six days a week (not Sundays), the Honolulu Fish Auction welcomes weary-eyed visitors who have gotten up early to see this magical event. Located at the end of Pier 38, this fish auction is the only fish auction that sells fresh tuna in the United States. If you enjoy tuna (or ahi as the locals call it) in your sushi then you’ve probably taken a bite out of ahi that made its way through the Honolulu Fish Auction. Auctions begin at 5:30 a.m.
3. 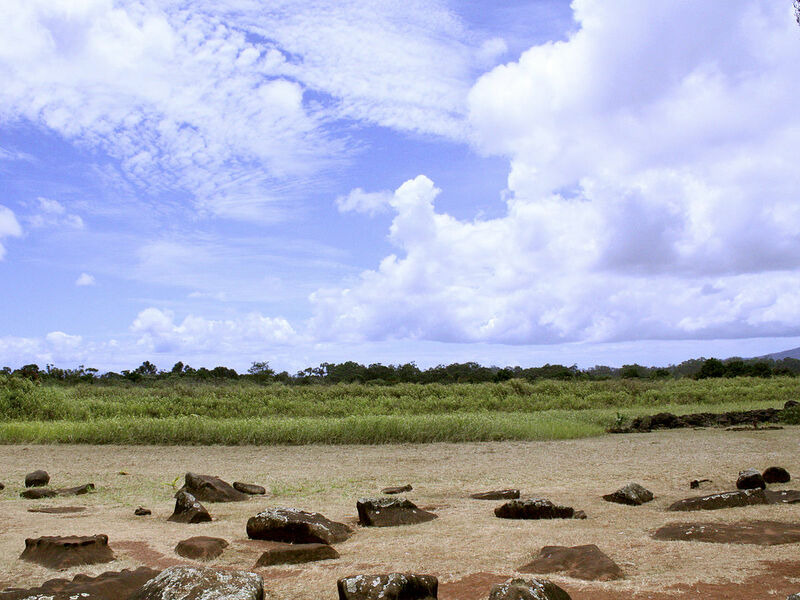 Kukaniloko Birthing Site: The Kukaniloko birthing stones are located in Wahiawa and were placed in a spot where the ancient islanders believed the life force of the land was strong. When a new chief was to be born, the mother would be brought to the rocks and under the watch of anywhere from 36 to 48 chiefs, the birth would take place. When the birthing was complete, the child would be swept away, not to be seen by the mother until it had reached maturity. This was practiced to reduce the chance of murder from rival chiefs. Recent research has uncovered patterns on the rocks that could have served an astrological purpose. It is now believed that the stones may have acted as a sort of Pacific Island henge. In the modern day, rows of other stones have been added to represent the ranks of chiefs that would come to witness the births or defend their land, but the original stones also still rest on the site. The Kukaniloko birthing stones have recently been studied, and we've learned they may also have astrological significance. 4. Oahu Ghost Tours: Oahu Ghost Tours® takes guests to the most haunted sites on Oahu. Some of these sites include places visited by Hawaiian Night Marchers, places where sacrifices were made to ancient gods and goddesses of Hawaii, and more modern haunts, like those of old hospitals that housed sick children during World War II. All stories are true, and all sites are real. 5. Elvis Aloha Statue: The statue stands near the parking lot of the Neal Blaisdell Center in Honolulu, along a walkway to the concert hall’s ticket windows. Elvis, acoustic guitar strapped on, is depicted in full sweaty croon atop a circular pedestal, a sprinkling of stars surrounding the title “Elvis: Aloha from Hawaii.” Another plaque on the walk credits the TV Land connection. Of course, “The King” wears a lei of fresh flowers. Why that location? Apparently, this was the site of the “World’s First Satellite TV Concert” performed here on January 14, 1973. The statue was unveiled on July 26, 2007. While you’re at it, visit another quirky attraction, the Jack Lord bust at Kahala Mall. Hawaii 5-0 fans will appreciate seeing the famous actor’s bust adorned in fresh lei. If you’re REALLY inspired, book the Hawaii 5-0 Locations Tour through Hawaii Aloha Travel and visit the on-location sets used for the updated Hawaii 5-0 series. Sure, hitting all the major attractions is a right of passage when you visit Hawaii. But, don’t forget to see the quirkiest attractions on Oahu — sometimes the best memories are made when you take the road less traveled. If you have something you’d like us to talk about or need some advice reach out to meAlohaBruce and we’ll answer on out next podcast.